The Windows Phone 7 push notification is actually an extremely elegant way of doing push notifications. Personally, I love it. I’ll walk through the steps conceptually here and then mirror the steps in the code post. Step 1: Say “Hey, phone! I want to send you push notifications about some stuff.” When you do this, you’re doing it with a couple of conditions. The first is that you’re giving your specific push service a name (like “Bob” but hopefully a little more specific). Next, you’ll need to determine if you want to use the “Toast” notification or the “Tile” notification or the “Raw” notification or some combination of these three. 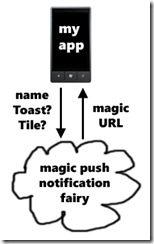 When you know what kind of notifications you want, you’ll basically write a magic piece of code which communicates to the magical push notification fairy, who, in return for your good deeds, gives you a device/application specific URL that you will use to send notifications to your phone. You think I’m kidding. I’m not. As a preview, the code you need to write is: “myPushStuff.Open()”. And that’s it. Then you just wait for the magical push notification fairy to give you the URL you’ll use to send notifications to your phone. You don’t actually need to send information about toast and tile to the push registration service. However, if you decide later on thatyou actually wanted to send a toast notifications, not a tile notification, your old URL won’t work… you’ll need to save a new one. Don’t know why or how exactly this happens… just passing along helpful information. If you’re looking for information about the difference between tile, toast and raw notifications, the image below was stolen from the msdn article that talks about the differences. Go read about it there… I won’t stoop to copying and pasting all their excellent information into my blog post. 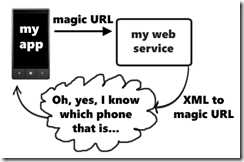 Step 2: Once you have your magical URL, save it in such a way that whatever webservice you’re using can recognize which phone it’s tied to. Maybe you’re saving it along with a username or with a zip code (like with a weather service). In any case, you’ll want to be able to send the right push notifications to the right phones. When the time comes to send the notification, your webservice will need to send an XML chunk created for your notification (see details here) to the phone-specific URL. Then, the Microsoft Push Notification Service handles your push request and forwards it to the phone, sending a response telling you that it worked (or didn’t work). The next post will walk through the steps to register your app for push notifications. I’ll post a link to it in this post when I get it up. This entry was posted in Windows Phone 7 and tagged push notifications, Tutorial, Windows Phone 7. Bookmark the permalink. Great blog!! I have an isusue with MPNS push service. I have written a small application which gives in the ChannelurI. Using this channeluri i am trying to push from the rest client. But i get 400 bad request. But my App is not getting the Notification and the channel is closed every time I try this. If you like to the the script I can send it to an email address or post it here.